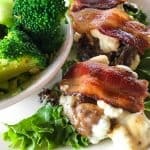 A quick easy sliders recipe to add to your favorite keto appetizers. These cheeseburger sliders are delicious and fancy enough to serve at your next house gathering. Nothing says comfort food like a good old American cheeseburger. It’s a shame you have to give it up on the keto diet. Or do you? These sliders are amazing! They’re packed with so much delicious flavor that you will not even miss the buns. Of course, you can always add keto biscuits if you DO miss the buns. This slider recipe calls for garlic, mushrooms, onions, spices and herbs to pack a flavorful punch and meet your keto macros at the same time. This cheeseburger slider recipe is very flexible, you may add your favorite cheese on top or herbs and spices. Just be sure to keep fillers our so it remains keto. No breadcrumbs necessary. You can also freeze leftover burger sliders for keto meal prep. Simply pop them into a baking dish to reheat in an oven or microwave. Every mouthful of this tasty Keto cheeseburger sliders recipe is so delicious you won’t even miss the bun. 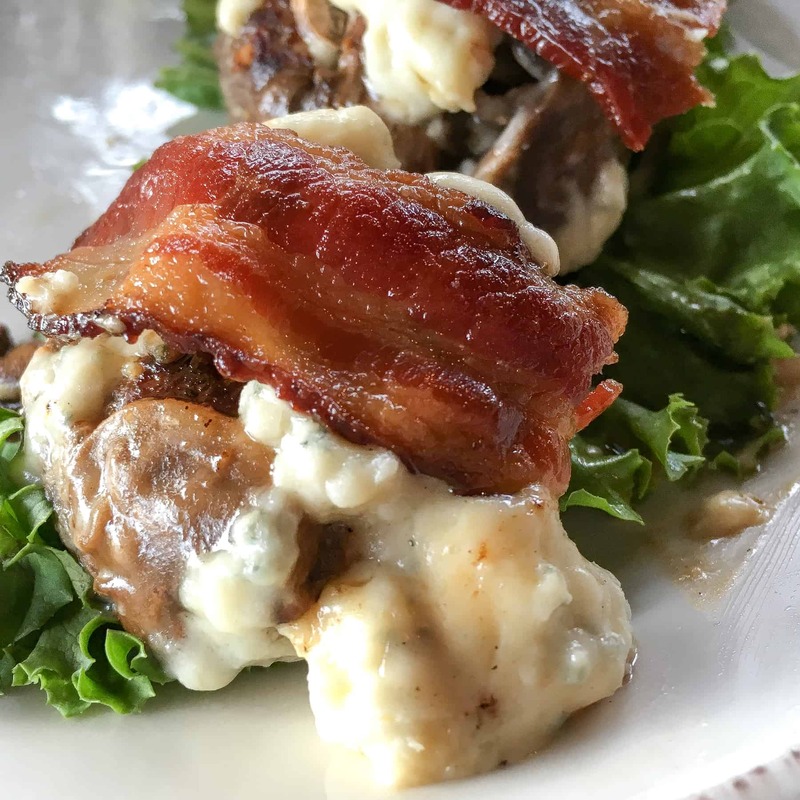 Finely minced garlic and onion impart juiciness and flavor to premium quality ground beef, while bacon, mushrooms, and sautéed mushrooms make every bite something to savor. Preheat oven broiler to high and set top oven rack to the second highest setting. Add ground beef, mustard, garlic, and onion to a medium bowl. Season with salt and black pepper, to taste, and mix with a fork or your fingers until all ingredients are thoroughly combined. Divide beef mixture into 8 portions and shape each into small patties. Set patties on a plate and gently press each with your thumb in the center to keep them from puffing up while cooking. Set aside. Heat olive oil over medium-high heat in a large, oven-safe skillet. Add mushrooms and cook, stirring occasionally, until mushrooms are nicely browned, approximately 5-6 minutes. Remove from heat and transfer mushrooms to a small bowl and set aside. Add remaining tablespoon of olive oil to pan and swirl to coat the bottom. Add slider patties to the skillet and cook until brown on each side, approximately 2-3 minutes per side. Remove from heat and top each slider with sautéed mushrooms and crumbled blue cheese. Place skillet in oven under broiler for 2-3 minutes, or until blue cheese starts to melt. Remove skillet from oven and top each slider with a piece of bacon and serve immediately on a bed of lettuce. If using broccoli as side, steam in lightly salted water and serve. Enjoy! 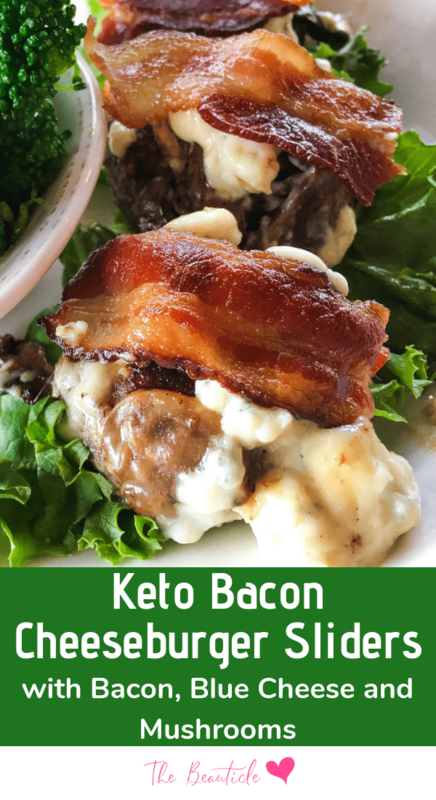 Bored of eating the same keto meals over and over? Check out these amazing recipes! Looking for a guide to sticking to the keto diet? Our Complete Guide to the Ketogenic Diet Book is a complete, all-in-one resource for starting and sticking to the ketogenic diet. This book includes all the need-to-know info about the keto diet plus meal plans, checklists and grocery lists to get you started. Want the grocery list for free? Get it below.